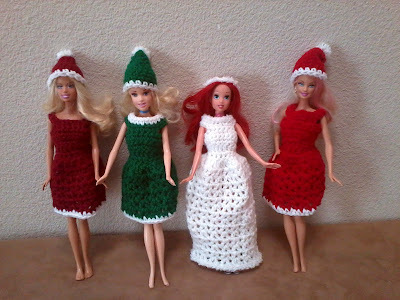 So last year a few months before Christmas, I taught myself how to crochet my girl's Barbies a few Christmas outfits. These were my first attempts. Turned out pretty cute, even added some matching Santa hats for the final effect. Ariel that lucky gal even got a "snowflake" wedding gown and they have a simple single pearl button on the back to make it easy for kids to get them dressed and undressed. The girls loved it! All in all I think they turned out pretty cute. I'm going to play around with them a bit. My 5 year old wants a black and white dress, so I'll attempt that next. may i have the pattern?